I just wanted to compliment your work and website. I bought the modified pilates workout over a year ago. It's easy to make excuses and look elsewhere for another program... One day this week I did the workout and really paid attention to your instructions. The next day I felt sore, but in a good way, as in a complete body stretch! I must keep up with the workouts to feel better! I'm curious about the exercise ball workout. Is the beginner's workout okay for seniors and people with back and sciatica issues? Hi Rita and thank you so much for your comments. I am glad you are back to your exercises. It doesn't take long to do them and the results are wonderful. The Exercise Ball Workout is definitely more challenging than the Healthy Back and Joints DVD because of the instability and weight of the ball. I do give modifications in during the workout and just encourage people to do what they are comfortable with. I think the Pilates Ball Workout is a great accessory to the regular matwork even if you only find a few exercises that you like or are able to do well, just add more as you are able. The format starts by sitting on the ball, which sometimes helps sciatic pain and sometimes makes it worse. It depends how strong your core muscles are to begin with. If done correctly they should not hurt your back but really challenge your deeper transverse abdominals that protect and support the spine. The sitting exercises include some great side and rotation stretches along with single leg balance exercises. The side lying exercises really challenge the core and oblique muscles, the side stretches feel great to open the spine and ribcage to stretch the latisismus dorsi muscles. The last section where you are lying belly on the ball helps with the deeper core musculature, balance, and upper body strength. Once you feel very comfortable and have precisely mastered all the classic mat exercises I would add in some of these ball exercises for more challenge. I am a 67 old woman who has had two lower back surgeries (1975 and 1984). Those were the days when they didn't prescribe any rehab after surgery..just walking. I would like to strengthen my core (which is very weak) and stretch my hamstrings, unfortunately any stretches I usually do end up irritating more than helping. I also have an inflamed femoral nerve in my left hip and groin area. Would any of your stretches be of benefit to me? I would definitely be a beginner. I have never tried Pilates. I am truly looking forward to hearing from you. Hi Tamera and thanks for your question. I do believe Pilates could benefit you under the proper guidance. From what you are telling me, when your core muscles are weak and you try to stretch your hamstrings without core support they can pull on the lower back causing more pain for sure. Learning neutral spine and then developing your core muscles to support this action would be very helpful to your condition. This page has some useful back stretching exercises. Check out my Beginner Pilates DVD workout here. 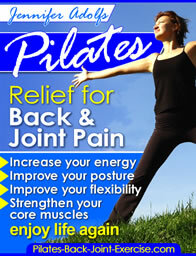 Or...the newly revised Pilates Ebook with progressive levels of exercises from beginner to advanced.